Microsoft had an excellent showing today at their Press Briefing for GamesCom 2015. They are really going to make Sony work to keep that lead! Phil Spencer started off the show with a statement about Microsoft’s dedication to gaming and their Xbox and Windows customers. There is a lot coming for Xbox One and Win10, to be sure. The first game to be shown was Rare Replay, available today. Next up was a World Premiere of both a new gameplay trailer and a cast trailer for the live action companion piece for Quantum Break. The game looks like a lot of fun and I really like the casting choices. Crackdown 3 is returning in a big way. They are bringing us a multi-player experience with an 100% destructible environment. Pay close attention, there is an actual mention of the Microsoft Cloud. I’m glad that’s still a thing. Scalebound gets some love with a gameplay trailer. Next up is info on features and accessories. There will be DVR of live television through the One Guide. The recorded shows can be streamed or downloaded to any Win10 device. They also announced that a chatpad for the Xbox One controller is available for pre-order, as of today. It will be released on November 10th, 2015 for $34.99. That’s a little higher than I expected, but I did get a lot of use out of the 360 version. Backward Compatibility is a priority for Microsoft now. Today’s announcement is that all future Xbox 360 Games With Gold titles will be playable on the XB1. They are being very smart about tying it in as an exclusive feature for multi-platform titles, like getting the two Vegas games when you buy Rainbow Six: Siege. Killer Instinct, Season 3 is coming to Xbox One and Win10 in March of 2016. Rash from Battletoads is a playable character in the current season, as of today. ID@Xbox is up, showing some impressive new games from independent developers. The Xbox Game Preview program is featured next, which basically allows gamers to test out early versions of upcoming titles. They feature We Happy Few, billed as “A game of paranoia and survival, in a drugged-out, dystopian English city in 1964.” The trailer is creepy. Really creepy. Microsoft shows a pretty impressive tech demo of DirectX 12, highlighting the detail that is possible with their API. Oxeye Game Studio, headed by a lead developer from Mojang, announce their new game. Cobalt is a local multiplayer platformer. The Dark Souls III trailer gets it’s world premiere now. I haven’t played the earlier parts of the series, but I hear great things. Homefront: The Revolution is an interesting title. The US has been invaded by North Korea and you are part of the resistance movement. I’m looking forward to checking this one out. Here is the trailer and also the game play video. FIFA is looking good. They’ve done a lot with their Legends features and the new European FIFA 16 bundle is pretty. This next bit seemed a little disjointed, but it may just be that I don’t follow eSports, so it’s not for me. Here is a video of a match between a UK and a US team. The Halo 5 1TB console bundle will be available for pre-order later today. Just Cause is back with a third iteration. The gameplay looks just as over the top as ever! Xbox gamers get the BC version of Just Cause 2 when it launches on December 1st. The Forza Motorsports team shows off their wet surface racing tech a bit with a new trailer. I can’t believe that it has been 10 years since the original! 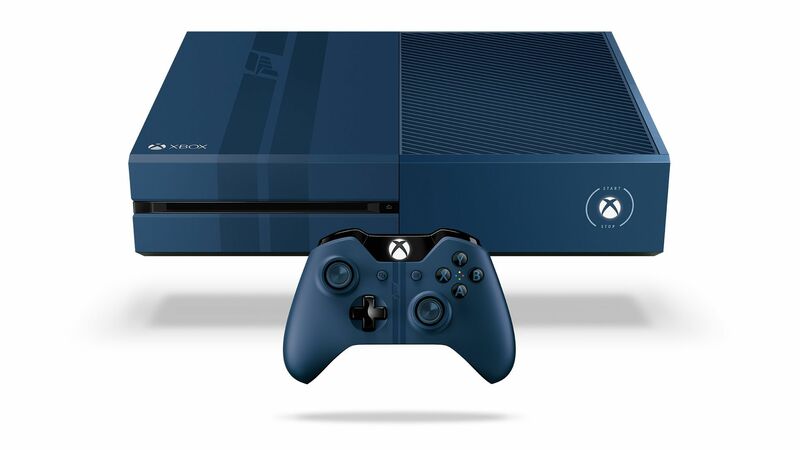 and the Forza 6 console isn’t too shabby either! Next up, a new Rainbow Six trailer. The trailer isn’t overly exciting, but this one will be a must buy for many gamers. Rise of the Tomb Raider, as many already know, will be an Xbox exclusive for the first year. I love this series and am sure to pick it up at some point. It’s going to be tough to find the time! And here’s a nice little surprise for the end of the show… Halo Wars 2! It releases Fall 2016. So that about wraps it up. Coming off of a really impressive E3, it’s good to see that Microsoft is keeping up the pressure. We’ll see you in the Lobby! When it was announced that Bethesda was holding their very first press briefing, I figure that Fallout 4 info was a given. What I didn’t expect was that we would get a 2015 release date. November 10th of this year, to be precise. Wow. I was going to write this in the same order as the presentation, but why bury the lead? Let’s hope that they are able to finish development and deliver a polished product by that date. Bethesda, if not, please delay this title. I don’t think that any of us can take another highly anticipated AAA title that is broken when we open the package. That said, let’s move on to the presentation! The gameplay trailer looked great! It was dark, creepy and felt very dangerous. It’s amazing to see how this game series has evolved from the piece of pixelated addiction of old to this high framerate shooter with rich, bloody textures and plenty of adrenaline-inducing action. And the violence! This one is definitely a title that is better kept from the little ones. I witnessed dismemberments, chainsaw bifurcation and an incredible amount of bullet damage. Enjoy!?! A welcome surprise with the official announcement of Doom was the unveiling of SnapMap, the multi-player mapbuilder function. This builder allows you to design and share your own maps with other users on both Xbox One and PS4. Take a peek at the video below. Billed as a Team-based Action Combat title, Battlecry reminds me a lot of a primarily melee Team Fortress. If Team Fortress had taken place in a modern Jade Empire. It’s hard to tell what to make of this one, so check out the trailer for yourself and sign up for the beta at battlecrythegame.com. It’s a very easy process. All you have to do is enter your date of birth, your email address and check two boxes. Submit! It’s no secret to our listeners/viewers, that I was no fan of the original Dishonored. For those new to The Lobbycast, I was barely able to put an hour into the game. I still can’t believe that our very own Erin had the patience and dedication to get the achievement for completing the game without killing a single enemy. That is truly an achievement, agent! They also announced a Definitive Edition, which will be graphically advanced and will include all of the previous DLC, coming to Xbox One and PS4 this fall. Bethesda showed a trailer for a game that I have been enjoying since it’s release last week. I believe the message here is that there is more content being added this year. ESO holds a special place in my heart, because ever since we first got our grubby mitts on Morrowind, we have been waiting for a chance to adventure together in that world. Oblivion and Skyrim only intensified that anticipation. Now we have it, and it is great. It’s not without it’s issues, but I have been having a really good experience with it. Legends is a strategy card game that will arrive on PC and iPad later this year. They didn’t show this trailer in the presentation, but it should be here, both for those who hadn’t seen it and for those that haven’t seen it enough. This is what I have been waiting for. The presentation completely lived up to my expectations. One of the first improvements that they showed off was the character creation system. Check it out! Next up, the reveal of the new and improved Pipboy, your in-game menu system. The big deal here is that you are able to get an actual, wearable version of the Pipboy with the Collector’s Edition. You are able to insert your phone and, with the iOS or Android app, use it seamlessly with the Xbox One, PS4 or PC versions, as if you were using the in-game menu. Watch below, but beware: Todd Howard gets a little excited in talking about this feature and drops a well-received f-bomb. Taking a break from Fallout 4, he announces Fallout: Shelter, a mobile game available tonight on iOS. The game is free of charge. Todd moves on the the building system within Fallout 4. This is very impressive. You can recycle building materials in the game and create new structures, building just a home or a small community that npcs will start populating over time. This rolls into a weapon-crafting segment. All in all, Bethesda did well with this presentation, especially considering that it was their very first. Well done! Join us for our continuing coverage of E3! As always, we appreciate your time. Leave us a voicemail at 512-522-9278 and we’ll do our best to address your comments on the show.